The Green Lake Park is located at the foot of Luofeng Hill and the Wuhua Mountain, opposite to the Yunnan University in Kunming. It original named Caihaizi. There used to be a bay of Dian Lake. As the water level of Dian Lake declined and a small lake was formed. It is also named “Jiulong Lake”, as there are 9 mouths of spring at northeast of the lake. 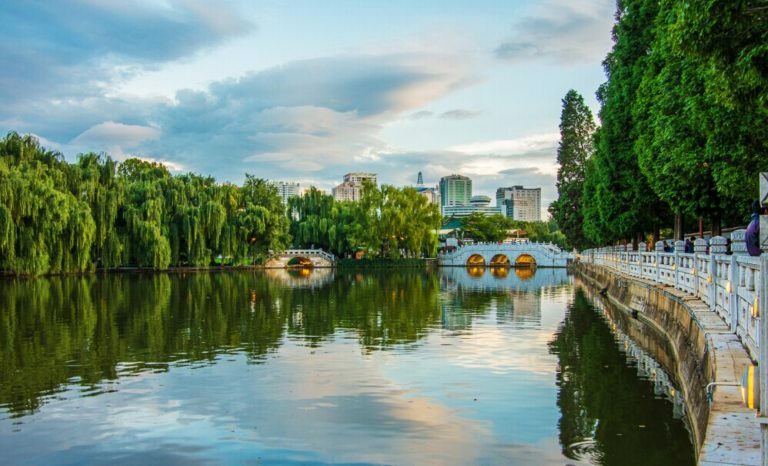 Green Lake Park is one of the most beautiful park in Kunming. As the water is green, the bamboos around the lake are green, and willows in summer and spring are green, hence the name. It is reputed as the emerald of Kunming City. The Ruandi Embankment across Green Lake from south to north was built by Ruanyuan, the governor of Yunnan and Guizhou, in 1834. And the Tangdi Embankment extending from east to west was built by Tangjirao in 1919. Goldfish Island is a good place for walking, resting and tea tasting. There are cedar, camphor and other trees grow on the island. Flowers around the paths, birds singing and slow wind on the island are so pleased for visitors. Bamboo Island is full of bamboos on the island. Folk artisans and singers usually get together here. They sing songs, dancing, acting and do some improvisational performances, making the island very lively. Lotus Temple, built in 1867 during Qing Dynasty. Each year, in November and December, groups of black-headed gulls fly from Siberia to Green Lake to spend the winter holiday here. It is a good time to do birdwatching in winter. It is suitable to visit the park all year round, especially in summer and winter. In summer, the lotus blossom very well. In winter, groups of gulls fly to the lake, which is very grand scene. Plaza at the city center is available to go to Green Lake directly. There are lots of cafes and restaurants nearby, and at the centre of the city, 500 meter far from the lake, many local famous and delicious foods are offered, you can taste these foods after you enjoy the picturesque park. 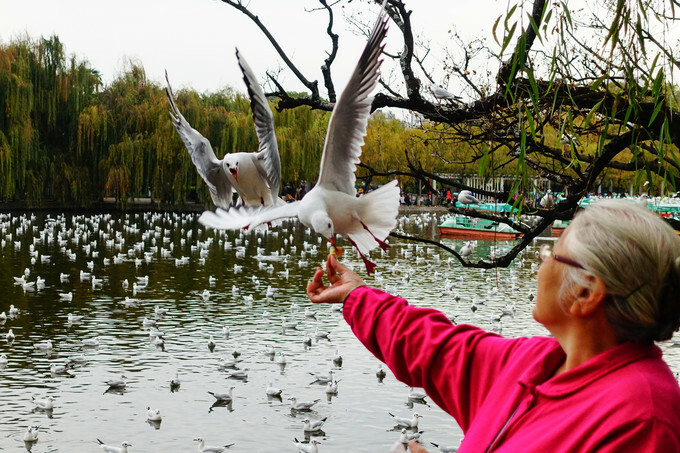 You can also take One Day Kunming Highlights Tour Including The Green Lake. There are many tourist destinations nearby, like Kunming Zoo and Yuantong Temple.